Diane Lowman always had a crush on Shakespeare. For as long as she remembers, the Westporter loved the long-dead English author. But when her sons Dustin and Devin graduated from Staples High School, Diane — who kept busy in her 20-plus years here by volunteering in school libraries, tutoring and substitute teaching Spanish, and doing nutrition consulting with groups like Homes with Hope and Project Return — found herself with empty-nesting time. Then a friend mentioned a cousin was earning a master’s degree in English. A light bulb flashed. The research group is part of the University of Birmingham (England, not Alabama). Based in Stratford-upon-Avon, it offers a 13-month master’s program in Shakespeare studies. 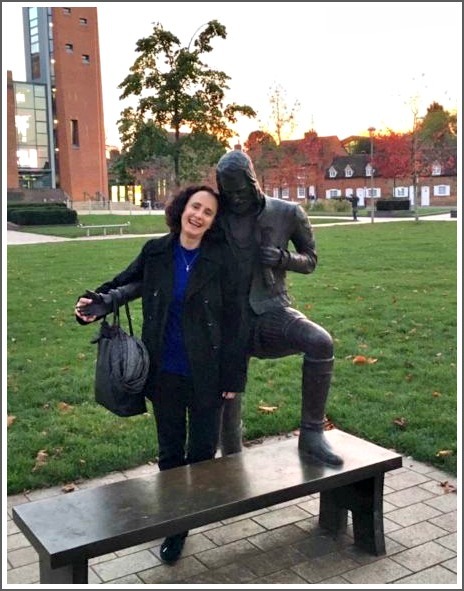 Diane Lowman with her crush, at Stratford-upon-Avon. The experience exceeded even her lofty expectations. “I pinched myself every day,” she reports. She lived in the beautiful West Midlands, surrounded by farms, sheep and swans. The Cotswolds were close. The Institute’s professors were “Shakespeare’s brain trust,” Diane notes. Yet they were exceptionally accessible, caring and helpful. Her flat was 2 blocks from the Church of the Holy Trinity, where the writer is buried. Diane visited often. “I would just sit and chat with him,” she says. The Royal Shakespeare Company was half a mile away. She saw every play they produced. Diane also volunteered at the Shakespeare Birthplace Trust. She had access to the full archives — including rare, barely seen materials. She flipped through a 1623 folio of the playwright’s works — the first time they were compiled together. “I actually cried,” she says of that experience. 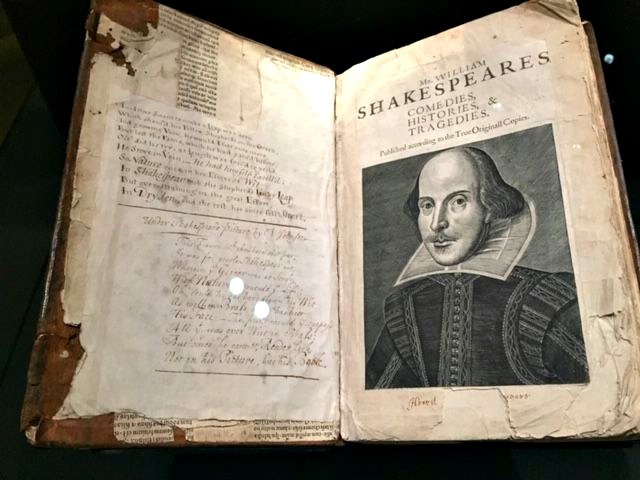 Diane Lowman held this rare Shakespeare folio. Now — 13 months later — Diane has her master’s degree in Shakespeare. What does that mean for her life? “That’s my big quandary: What do I want to do when I grow up?” Diane admits. She has met with the creative director of Shakespeare on the Sound, and contacted Norwalk Community College about teaching a lifetime learners’ course. She’d also like to do a “Kids’ Introduction to Shakespeare” through the Westport Library. As Diane Lowman starts to figure out her next steps, there’s one literary certainty. 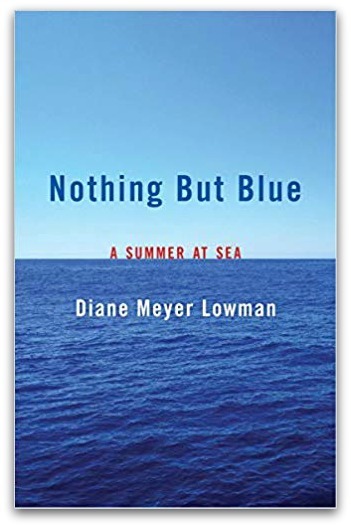 Her memoir, “Nothing But Blue,” has just been published. It’s a trip back to the summer of 1979. Diane — a 19-year-old Middlebury College student — spent 10 weeks working on a German container ship, with a nearly all male crew. She traveled from New York to Australia and New Zealand and back, through the Panama Canal. The voyage changed her perspective on the world, and her place in it. She left as a “subservient, malleable girl,” and returned as a confident, independent, resilient young woman. That long-ago journey was not much different from her recent one. Ultimately though, Diane learned and grew from both. This entry was posted in Education, History, Library, Media, Organizations, People and tagged "Nothing But Blue", Diane Lowman, Shakespeare Birthplace Trust, Shakespeare on the Sound, William Shakespeare. Bookmark the permalink. Congratulations to Diane on her accomplishment!! She has been an inspiration to my children, Jackson and Katy, and I in many different ways since we first met her twenty years ago. Can’t wait to read her book and see her now that she’s back in Westport! What a beautiful and inspiring journey…I haven’t met Diane but feel touched by her story. Thanks for sharing and congratulations on your book! A wonderful story …Thank you for sharing! I want to take her Shakespeare class! Hope it happens!